Hi, Carisa here from Messes to Memories… I’m back with some more crafts and ideas for the kiddos. The Christmas season can be busy and truth be told… a little stressful. This year I was determined to keep it simple, fun and exciting for the kids, while still helping them understand the true meaning of Christmas. I love Christmas and wanted my kids to feel the light and goodness of the season right off the bat. One magical craft that we’ve done with the kids this year are these beautiful melted crayon ornaments. Now, let me add a disclaimer, there is a lot of adult supervision and aid required in this craft, but no matter the age, kids’ eyes will light up with excitement when they see the beauty these crayons create. My friend is actually the one who found the inspiration and encouraged us to do this project with her and her family!! We grabbed our glass ornaments and some Crayola crayons (they melt the best). The kids helped unwrap the crayons and break them up. We broke each crayon into about 6 pieces. Then the kids helped pick out the color combos (with some guidance from their OCD parents–you can’t blame me, I don’t want any orange on our Christmas tree). The kids placed the crayon chunks… about 2-3 pieces in each ornament. Then they sat back and watched while the adults took over, with glove protected hands. (I know I’m not wearing pictures in the photo below, but you need to be wearing them to ensure that the glass ornaments don’t overheat and burn you.) This step is NOT one for kids to do. When our friends came over to help with this craft, we only had one blow dryer and I was impatient, so I decided to try melting the crayon over a candle. The result was amazing. I had so much more control over where the melted wax went and I was able to create some beautiful ornaments. So I finished all of ours up with a candle! You will definitely want to experiment with 1-2 ornaments and then decide on a technique. With my favorite ornaments, I started with 1-2 crayons in the bottom, made a pattern on the glass and then added another crayon and very strategically melted it in the clear space. If there was still more clear space, I would add a fourth crayon. All the ornaments that I did using this method had a cloudy sunset type feel to them and I think they are absolutely gorgeous! Another method we tried was just doing one color at a time, like the ornament below. Green on the bottom, with a grey band in the middle and topping it off with a dark blue. There is really no end to the creativity with this project and the kids will be thrilled at all the different color combinations. 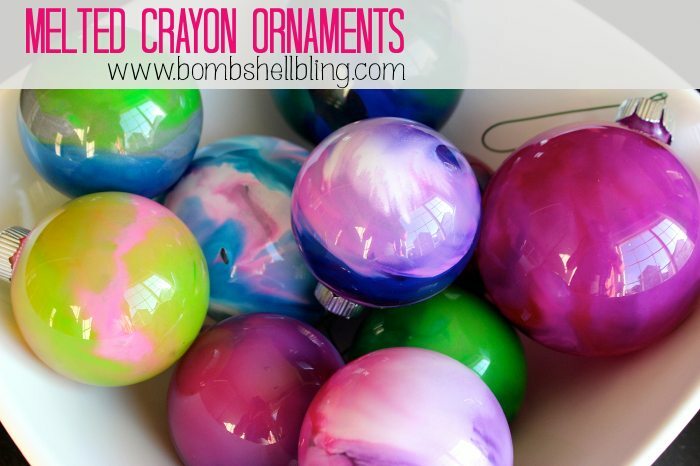 And that’s how you make Melted Crayon Ornaments!! If you are looking for some more fun Christmas crafts and treats, make sure you stop by and check out some of our most recent favorites on Messes to Memories! !